Rey’s lightsaber has certainly seen a lot of action, hasn’t it? If you’ll remember, that lightsaber was the one Anakin Skywalker had in Revenge of the Sith. He used it to furiously clash sabers with Obi-Wan on the lava-filled rivers of Mustafar. Obi-Wan defeated him and confiscated it, taking it with him to Tatooine for many years. Until it WAS found! It made its way into the hands of Maz Kanata and Rey found herself irresistibly drawn to the weapon. Now, she wields it hoping to bring peace to the galaxy; that is until…you get your hands on it! 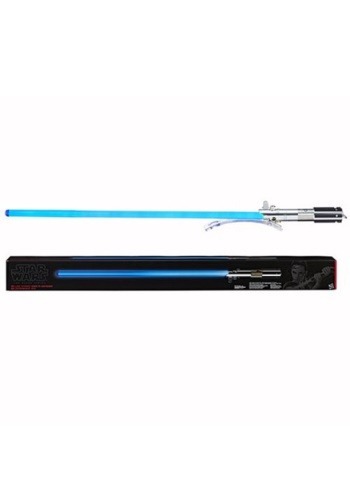 This Star Wars Rey Force FX Lightsaber is a Black Series collectible that recreates the weapon seen in The Force Awakens and The Last Jedi. It has light-up effects and real sounds from the movies. It also comes with a display base, so you can let is sit proudly on your shelf when you’re not practicing your lightsaber techniques.